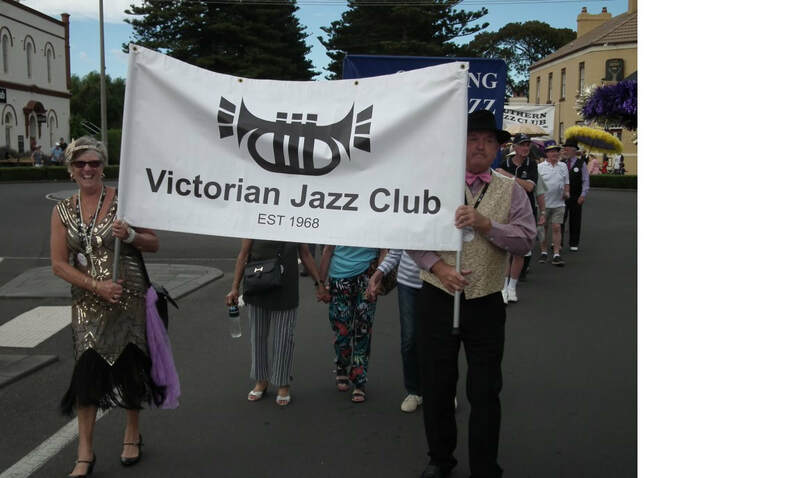 The second Port Fairy Jazz Festival took place during February - Friday 9th to Sunday 11th - and again, was a great success, attended by around 1700 jazz enthusiasts with more than 100 bands performing. The traders of Port Fairy most certainly have to be congratulated for their enthusiasm and pro-active attitude towards the influx of visitors - shops open all weekend, resulting in lots of happy shoppers and shop-keepers and quite a large amount of retail therapy!! The provision of a courtesy bus made it a trifle easier for some this year, with the addition of an extra venue or two, and the perfect weather certainly helped those who chose to be independent. The Hot b Hines workshop was a sell-out, and the organizational skills of John Huf and his team of volunteers must be applauded - there was nothing over-looked or forgotten. The entire production was a credit to them - even to the “thankyou to volunteers” nosh-up on Sunday night before everyone packed and wended their way home again. 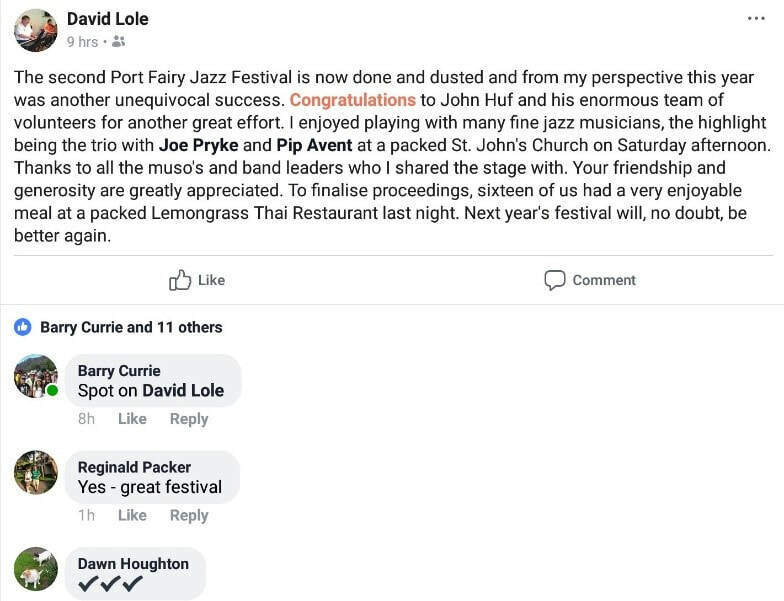 Given the VJC’s commitment to this great production, it was very gratifying to see the number of members who put their names forward to assist with volunteer jobs - all of which made for a big happy family of jazz lovers. Below and on the centre pages are some candid shots of various performances taken by George Krupinski who kept himself very busy over the weekend behind the huge lens of his gi-normous camera. There are some ideas floating around about the possibility of organising a bus for next year for those who don’t want to drive quite so far ! Might be worth thinking about! the Festival was another great success in the jazz world! be early to get a good seat! given an incredible amount of pleasure to those who follow the jazz movement! Bravo John and team ! Reproduced with permission—page 6 , JAZZBEAT – MARCH 2018 published by the Victorian Jazz Club Inc.